It’s a big week for Apple fans. 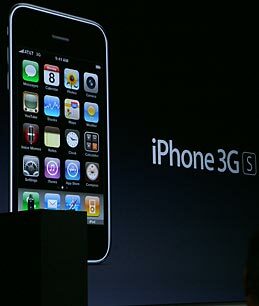 On Friday, the third-generation iPhone  dubbed the 3G  hits stores. And today Apple released its upgrade to the iPhone’s operating system, an event that, for some people at least, promises to be as exciting as the repeal of Prohibition. At last, long-suffering iPhone users will be able to copy and paste information from one application to another. That’s but one of a hundred new features packed into the 3.0 upgrade, which was unveiled just in time for a midday diversion. The upgrade does a comprehensive job of closing what few holes there were in the popular smartphone while extending its reputation for being the most cutting-edge gadget in the gizmosphere. During the past few months, hundreds of thousands of software developers and other digerati have been beta-testing the upgrade and broadcasting its assorted charms. As the iPhone has evolved into a full-fledged pocket computer, with more than 50,000 applications, it has become a bit more cumbersome to use. I’ve got more than 120 apps, for instance, stacked 20 to a screen, that I have to arrange or alphabetize by hand. The upgrade addresses that problem by creating a universal search function that can scour all applications; many users are making this their home screen so they can instantly find the applications they want. With the upgrade, iPhone users will finally catch up with BlackBerry users, who have always been able to search their messages and sort them by a variety of criteria. That said, the new search function will not scan the body of messages  just subject and sender data. But that alone will doubtless make the iPhone more appealing to business people and other e-mail-intensive users. Application alerts. The iPhone’s main limitation prior to this upgrade was that it could typically run only one application at a time. Now, an application can contact you even if it’s not running, meaning you don’t need to be using, say, an instant-message app to be alerted that you received a message. This fix, which lets apps alert users via text messages, also means that all those cool-sounding social-network apps that let you know when a pal is nearby will finally work. In geekspeak, this alert system is known as “push notification,” and it’s something software developers have long wanted. The ways this feature will be used are endless, and useful. Multimedia messaging. Users can now send photos, vCards  that is, contact info  and, with the upcoming 3G, video the same way they send text messages. One nice upside is that this enables users to send rich media to friends who don’t have e-mail on their phones. Third-party hardware support. Apple is extending the iPhone platform to hardware makers so that they can attach all manner of things  from glucose and heart monitors to GPS mounts that plug your phone into your car’s stereo. 3G tethering. Use your iPhone like a wireless modem and connect a laptop to it. Never pay for wi-fi at a hotel again! At least, that’s the promise of this technology. In reality, we have no idea what U.S. cellular partner AT&T will charge users; AT&T hasn’t even said yet when it will open its network to this feature. In-app subscriptions and parental controls. As a magazine guy, I couldn’t resist this one. While this feature will mainly be used by game developers  buy the game and pay for new levels, for instance  it’ll be a boon to the periodicals business too. We could, theoretically, develop a TIME magazine app and sell subscriptions. And with parental controls, Apple is clearly getting out of the censorship business, putting those decisions in the hands of users. Of course, some of the new operating system’s power will be realized only on the 3G, which promises to be faster and have a greater variety of bells and whistles that are missing on the current version. For Apple fans, the only thing that would make this week more exciting would be if Steve Jobs, who’s been out on sick leave and is due back by the end of June, finally returned.